Contact me at ilovedrywell@gmail.com for prints. Oh, snap. It's Meat[ball] Sections! Following up on the rousing success (at least in my own mind) of Taqueria Week, I decided to launch another weekly theme.... this time Meatballs of The World. 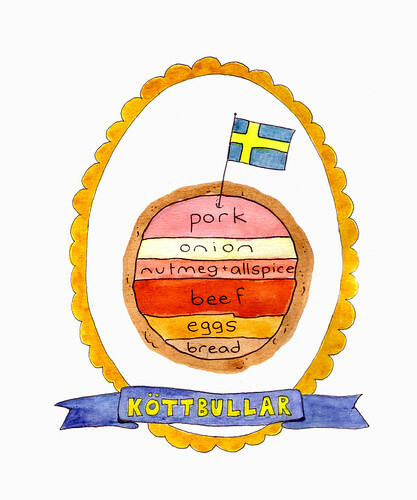 Kicking it off is the old IKEA standby, Swedish meatballs, or Köttbullar. I found a few variations of this meatastic orb of, uh, meatiness, but most used a combination of beef and pork, along with onions, egg and bread. Most also added either nutmeg or allspice, or both, which gives them their unique Swedishness. Smother them in creamy sauce, serve with lingonberry preserves and they are utsökt ("delicious")!